Free. Ages 12+ Learn the joy of making rhythm with your feet at this high-energy class lead by one of Rhythmic Circus's principal dancers. Space is limited to 25 dancers. There is no cost but due to limited space, registration is required. 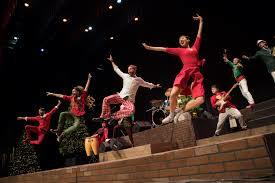 Attend the Rhythmic Circus: Holiday Shuffle show on Sunday, December 2 at 2 p.m. at the Paramount. Tickets available here. Confirmed: This WILL go on as scheduled despite the snowy weather. Please use your judgement when traveling to the Paramount.